A) Following (external) - this is discipleship; Jesus is followed around by his pupils. B) Imitation (internal) - this is a person’s inner conformity to the nature of Christ. A. Sharing the divine nature is the definition of Christian existence (1 John 1:5-7; 3:1-3; 4:17; Col 3:9). B. Forgive as God has forgiven you (Eph 4:32; Col 3:13; Mt 6:14-15). C. Love indiscriminately like God does (Lk 6:32-36; Mt 5:43-48; 1 John 4:7-12). A. "Being in Christ" is the definition of Christian existence (1 John 2:6). B. Having died with Christ, we share his risen life (Rom 6:6-11; Rom 8:11; Gal 2:20; Col 2:12). C. Loving as Christ loved, giving himself (John 13:34; John 15:12; 1 John 3:11-16; 13:34). A. Suffering with Christ is the definition of apostolic existence (Phil 3:10-11; 2 Cor 4:10; 2 Cor 1:5; Col 1:24). B. Sharing in divine condescension (Phil 2:13-14). C. Give your life as he did (Eph 5:1-2). D. Suffering servanthood instead holding power (Mark 10:42-45). E. Accept innocent suffering without complaint just as he did (1 Peter 2:20-21, 3:14-18, 4:12-16). F. Suffer with or like Christ the hostility of the world, as bearers of the kingdom cause (Lk 14:27-33; John 15:20-21; 2 Tim 3:12). G. Death is liberation from the power of sin (1 Peter 4:12; Gal 5:24). H. Death is the fate of the prophets; Jesus was already following them (Lk 24:19-20; Acts 2:36, 4:10; 1 Thess 2:15). I. Death is victory (Col 2:15; 1 Cor 1:22-24; Rev 12:10-11). According to Yoder, readers (like me) who are unaware of the political dimensions of Jesus' ministry may understand the 'in Christ' references in the NT letters to be some sort of mystical, private process and the 'dying with Christ' references as a morbid psychological experience. However, if we believe that the apostles used their core memory of Jesus' earthly ministry to talk about social ethics, then the fact that they centered their ethics on the cross has to mean a social stance which is compulsory for believers and often costly. Yoder is emphatic that the only place where believers are supposed to imitate Jesus is in the taking up of the cross. He does not want his arguments to become a blanket grounding for compulsory celibacy, for example. "Servanthood replaces dominion, forgiveness absorbs hostility" (131). I'm still one of those old fashioned guys who thinks that only part of what Yoder is saying is spot-on when it comes to kingdom living. But I do not follow Yoder wholesale in his belief that every single thing Jesus did was to send a political message. Yoder seems to think that the characteristic which leads to persecution for believers is their nonviolence. I believe, on the contrary, that though this might be a characteristic of the faithful, it is their proclamation of the spiritual message of the Gospel, which is offensive to the natural man which can will result in persecution. I am appreciating your summaries of Yoder. To your last point, that Yoder believes that the characteristic of a Christian that leads to their persecution is their nonviolence. Could it not be argued, as is often done by political conservatives (and liberals, but mostly conservatives), that if we don't have a strong military, we will be overrun by Muslims or extremists or other nefarious figures? In other words, due to sin in the world, if we appear weak we will be taken advantage of, enslaved, killed etc. In which case, a unilateral doctrine of forgiveness and nonviolence is indeed a political invitation to be persecuted. Thus Yoder appears right that by the world's standards a politics of forgiveness(nonviolence) is weakness and thus an invitation to be dominated. Yoder would probably prefer not to argue in these terms, however. He would rather argue with your last statement. Yoder would not concede the dichotomy of the "Spiritual message" and the actual performative aspects of faith (nonviolence), as though they were different things. He would say they are two sides of the same coin. In which case, someone who suffers as a result of their proclamation that "Jesus is Lord" does so not just because they believe this "spiritual" truth, nor because they believe it to be true for everyone (and thus their desire to proclaim it), but for the extremely obvious reason that they carry this message without recourse to worldly power and willingly suffer death, realizing that they don't need violence to prove they are right. Because if Jesus really is Lord, then he is Lord over death, and we have nothing to fear from that which can kill only the body. It should go without saying that those who do as Jesus did, "take up my cross and follow...", are necessarily nonviolent. 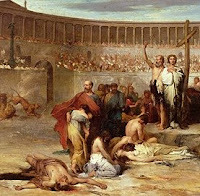 Put another way, the crucified body of the persecuted martyr is a form of gospel proclamation. Yoder would agree with you that martyrs die because of their gospel proclamation. But he would disagree with you that nonviolence isn't a part of that proclamation. The earliest Christian gospel proclamation -"Jesus is Lord" -would have undoubtedly been understood by the earliest Christians as a vindication of Jesus' incarnational way of life over the world and its ways. And Jesus' way was the cross. And as Paul so eloquently puts it, those who accept the cross of Christ are promised his (bodily!) resurrection. And this is the good news. Yoder would, I believe, accuse those making your distinction at the end between a "spiritual" gospel and "natural man" of gnosticism, in so far as the distinction borders on the rejection of the goodness of creation and the orthodox understanding of psychosomatic unity. For the gospel was never to the earliest Christians a "way to save your soul/spirit" but also the very real promise of bodily resurrection (hence Paul's obsession with the topic). Without maintaining both aspects of the gospel proclamation, Christianity devolves into gnosticism.